The other day I was going through the store and came across this display of Hershey’s Kisses that included Mint Truffle and Candy Cane kisses. I immediately snapped them up and knew I’d make something delicious with both of them. The mint ones went in the Food Blogger Cookie Swap cookies I made. These I made and kept all to myself. Pretty much. Oh how I love peppermint. I didn’t realize how much until I started baking with it though. These are sugar cookies that I actually based off of an Instagram picture of a handwritten recipe from someone’s grandmother. 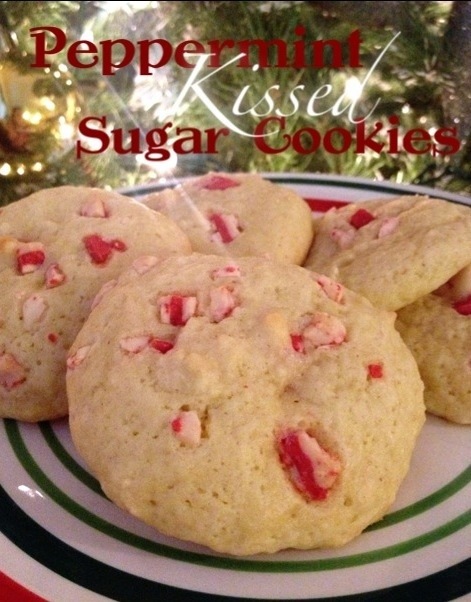 The cookies are stuffed with a peppermint candy cane kiss and sprinkled with peppermint crunch. They are soft and that little hint of peppermint is delicate. If you want more of a peppermint taste, I would suggest substituting the vanilla extract for a peppermint extract. In a medium mixing bowl, using an electric mixer cream together butter and sugar. Add eggs and mix together. Add in flour, salt, baking powder and vanilla. Mix together until combined. Cover dough and place in the refrigerator for 2 hours to chill. Preheat oven to 350 degrees. Using a cookie scoop, drop dough onto cookie sheet. 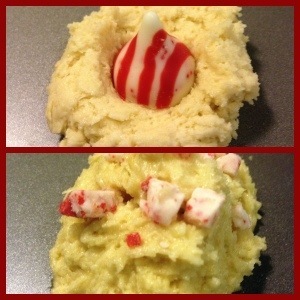 Place one unwrapped candy cane kiss into the dough. Wrap dough around the kiss. Add peppermint crunch baking chips to top of cookie dough. Bake for 9-11 minutes.